Simple PA systems are often used in small venues such as school auditoriums, churches, and small bars. PA systems with many speakers are widely used to make announcements in public, institutional and commercial buildings and locations—such as schools, stadiums, and passenger vessels and aircraft. Intercom systems, installed in many buildings, have both speakers throughout a building, and microphones in many rooms so occupants can respond to announcements. PA and Intercom systems are commonly used as part of an emergency communication system. The term, sound reinforcement system generally means a PA system specifically for live music or performance. In Britain any PA system is sometimes colloquially referred to as a Tannoy, after the company of that name now owned by TC Electronic Group, which supplied a great many of the PA systems used previously in Britain. From the Ancient Greek era to the nineteenth century, before the invention of electric loudspeakers and amplifiers, megaphone cones were used by people speaking to a large audience, to make their voice project more to a large space or group. Megaphones are typically portable, usually hand-held, cone-shaped acoustic horns used to amplify a person’s voice or other sounds and direct it towards a given direction. The sound is introduced into the narrow end of the megaphone, by holding it up to the face and speaking into it. The sound projects out the wide end of the cone. The user can direct the sound by pointing the wide end of the cone in a specific direction. 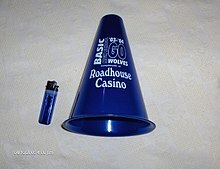 In the 2010s, cheerleading is one of the few fields where a nineteenth century-style cone is still used to project the voice. The device is also called “speaking-trumpet”, “bullhorn” or “loud hailer”. In 1910, the Automatic Electric Company of Chicago, Illinois, already a major supplier of automatic telephone switchboards, announced it had developed a loudspeaker, which it marketed under the name of the Automatic Enunciator. Company president Joseph Harris foresaw multiple potential uses, and the original publicity stressed the value of the invention as a hotel public address system, allowing people in all public rooms to hear announcements. In June 1910, an initial "semi-public" demonstration was given to newspaper reporters at the Automatic Electric Company building, where a speaker's voice was transmitted to loudspeakers placed in a dozen locations "all over the building". A short time later, the Automatic Enunciator Company formed in Chicago order to market the new device, and a series of promotional installations followed. In August 1912 a large outdoor installation was made at a water carnival held in Chicago by the Associated Yacht and Power Boat Clubs of America. Seventy-two loudspeakers were strung in pairs at forty-foot (12 meter) intervals along the docks, spanning a total of one-half mile (800 meters) of grandstands. The system was used to announce race reports and descriptions, carry a series of speeches about "The Chicago Plan", and provide music between races. Early public-address system from around 1920 using a Magnavox speaker. The microphone had a metal reflector that concentrated the sound waves, allowing the speaker to stand back so it wouldn't obscure his or her face. The early vacuum tubes couldn't produce much gain, and even with six tubes the amplifier had low power. To produce enough volume, the system used a horn loudspeaker. The cylindrical driver unit under the horn contained the diaphragm, which the voice coil vibrated to produce sound through a flaring horn. It produced far more volume from a given amplifier than a cone speaker. Horns were used in virtually all early PA systems, and are still used in the 2010s in most systems, at least for the high-range tweeters. Peter Jensen and Edwin Pridham of Magnavox began experimenting with sound reproduction in the 1910s. Working from a laboratory in Napa, California, they filed the first patent for a moving coil loudspeaker in 1911. Four years later, in 1915, they built a dynamic loudspeaker with a 1-inch (2.5 cm) voice coil, a 3-inch (7.6 cm) corrugated diaphragm and a horn measuring 34 inches (86 cm) with a 22-inch (56 cm) aperture. The electromagnet created a flux field of approximately 11,000 Gauss. Their first experiment used a carbon microphone. When the 12 V battery was connected to the system, they experienced one of the first examples of acoustic feedback, a typically unwanted effect often characterized by high-pitched sounds. They then placed the loudspeaker on the laboratory's roof, and claims say that the amplified human voice could be heard 1 mile (1.6 km) away. Jensen and Pridham refined the system and connected a phonograph to the loudspeaker so it could broadcast recorded music. They did this on a number of occasions, including once at the Napa laboratory, at the Panama–Pacific International Exposition, and on December 24, 1915 at San Francisco City Hall alongside Mayor James Rolph. This demonstration was official presentation of the working system, and approximately 100,000 people gathered to hear Christmas music and speeches "with absolute distinctness". This system was used by former US president William Howard Taft at a speech in Grant Park, Chicago, and first used by a current president when Woodrow Wilson addressed 50,000 people in San Diego, California. Wilson's speech was part of his nationwide tour to promote the establishment of the League of Nations. It was held on September 9, 1919 at City Stadium. As with the San Francisco installation, Jensen supervised the microphone and Pridham the loudspeakers. Wilson spoke into two large horns mounted on his platform, which channelled his voice into the microphone. Similar systems were used in the following years by Warren G. Harding and Franklin D. Roosevelt. Engineers invented the first loud, powerful amplifier and speaker systems for public address systems and movie theaters. These large PA systems and movie theatre sound systems were very large and very expensive, and so they could not be used by most touring musicians. After 1927, smaller, portable AC mains-powered PA systems that could be plugged into a regular wall socket "quickly became popular with musicians"; indeed, "...Leon McAuliffe (with Bob Wills) still used a carbon mic and a portable PA as late as 1935." During the late 1920s to mid-1930s, small portable PA systems and guitar combo amplifiers were fairly similar. These early amps had a "single volume control and one or two input jacks, field coil speakers" and thin wooden cabinets; remarkably, these early amps did not have tone controls or even an on-off switch. Portable PA systems you could plug into wall sockets appeared in the early 1930s when the introduction of electrolytic capacitors and rectifier tubes enabled economical built-in power supplies that could plug into wall outlets. Previously, amplifiers required heavy multiple battery packs. A woman using a small handheld electric megaphone at a demonstration in Portugal. Electric megaphones use a type of horn loudspeaker called a reflex or reentrant horn. In the 1960s, an electric-amplified version of the megaphone, which used a loudspeaker, amplifier and a folded horn, largely replaced the basic cone-style megaphone. Small handheld, battery-powered electric megaphones are used by fire and rescue personnel, police, protesters, and people addressing outdoor audiences. With many small handheld models, the microphone is mounted at the back end of the device, and the user holds the megaphone in front of her/his mouth to use it, and presses a trigger to turn on the amplifier and loudspeaker. Larger electric megaphones may have a microphone attached by a cable, which enables a person to speak without having their face obscured by the flared horn. The simplest, smallest PA systems consist of a microphone, an amplifier, and one or more loudspeakers. PA systems of this type, often providing 50 to 200 watts of power, are often used in small venues such as school auditoriums, churches, and coffeehouse stages. Small PA systems may extend to an entire building, such as a restaurant, store, elementary school or office building. A sound source such as a compact disc player or radio may be connected to a PA system so that music can be played through the system. Smaller, battery-powered 12 volt systems may be installed in vehicles such as tour buses or school buses, so that the tour guide and/or driver can speak to all the passengers. Portable systems may be battery powered and/or powered by plugging the system into an electric wall socket. These may also be used for by people addressing smaller groups such as information sessions or team meetings. Battery-powered systems can be used by guides who are speaking to clients on walking tours. Public address systems consist of input sources (microphones, sound playback devicrs, etc. ), amplifiers, control and monitoring equipment (e.g., LED indicator lights, VU meters, headphones), and loudspeakers. Usual input include microphones for speech or singing, direct inputs from musical instruments, and a recorded sound playback device. In non-performance applications, there may be a system that operators or automated equipment uses to select from a number of standard prerecorded messages. These input sources feed into preamplifiers and signal routers that direct the audio signal to selected zones of a facility (e.g., only to one section of a school). The preamplified signals then pass into the amplifiers. Depending on local practices, these amplifiers usually amplify the audio signals to 50V, 70V, or 100V speaker line level. Control equipment monitors the amplifiers and speaker lines for faults before it reaches the loudspeakers. This control equipment is also used to separate zones in a PA system. The loudspeaker converts electrical signals into sound. Some PA systems have speakers that cover more than one building, extending to an entire campus of a college, office or industrial site, or an entire outdoor complex (e.g., an athletic stadium). A large PA system may also be used as an alert system during an emergency. Some private branch exchange (PBX) telephone systems use a paging facility that acts as a liaison between the telephone and a PA amplifier. In other systems, paging equipment is not built into the telephone system. Instead the system includes a separate paging controller connected to a trunk port of the telephone system. The paging controller is accessed as either a designated directory number or central office line. In many modern systems, the paging function is integrated into the telephone system, so the system can send announcements to the phone speakers. PA over IP refers to PA paging and intercom systems that use an Internet Protocol (IP) network, instead of a central amplifier, to distribute the audio signal to paging locations across a building or campus, or anywhere else in the reach of the IP network, including the Internet. Network-attached amplifiers and intercom units are used to provide the communication function. At the transmission end, a computer application transmits a digital audio stream via the local area network, using audio from the computer's sound card inputs or from stored audio recordings. At the receiving end, either specialized intercom modules (sometimes known as IP speakers) receive these network transmissions and reproduce the analog audio signal. These are small, specialized network appliances addressable by an IP address, just like any other computer on the network. Wireless Mobile Telephony (WMT) PA Systems refers to PA paging and [intercom] systems that use any form of Wireless mobile telephony system such as GSM networks instead of a centralized amplifier to distribute the audio signal to paging locations across a building or campus, or other location. The GSM mobile Networks are used to provide the communication function. At the transmission end, a PSTN Telephone, mobile phone, VOIP phone or any other communication device that can access and make audio calls to a GSM based mobile SIM card can communicate with it. At the receiving end, a GSM transceiver receives these network transmissions and reproduce the analogue audio signal via a Power Amplifier and speaker. This was pioneered by Stephen Robert Pearson of Lancashire, England who was granted patents for the systems, which also incorporate control functionality. Using a WMT (GSM) network means that live announcements can be made to anywhere in the world where there is WMT connectivity. The patents cover all forms of WMT i.e., 2G, 3G, 4G ..... xxG. A UK company called Remvox Ltd (REMote VOice eXperience) has been appointed under license to develop and manufacture products based on the technology. A Long-Line Public Address (LLPA) system is any public address system with a distributed architecture, normally across a wide geographic area. Systems of this type are commonly found in the rail, light rail, and metro industries, and let announcements be triggered from one or several locations to the rest of the network over low bandwidth legacy copper, normally PSTN lines using DSL modems, or media such as optical fiber, or GSM-R, or IP-based networks. Rail systems typically have an interface with a passenger information system (PIS) server, at each station. These are linked to train describers, which state the location of rolling stock on the network from sensors on trackside signaling equipment. The PIS invokes a stored message to play from a local or remote digital voice announcement system, or a series of message fragments to assemble in the correct order, for example: " / the / 23.30 / First_Great_Western / Night_Riviera_sleeper_service / from / London_Paddington / to / Penzance / .... / will depart from platform / one / this train is formed of / 12_carriages /." Messages are routed via an IP network and are played on local amplification equipment. Taken together, the PA, routing, DVA, passenger displays and PIS interface are referred to as the customer information system (CIS), a term often used interchangeably with passenger information system. Small clubs, bars and coffeehouses use a fairly simple set-up, with front of house speaker cabinets (and subwoofers, in some cases) aimed at the audience, and monitor speaker cabinets aimed back at the performers so they can hear their vocals and instruments. In many cases, front of house speakers are elevated, either by mounting them on poles or by "flying" them from anchors in the ceiling. The Front of House speakers are elevated to prevent the sound from being absorbed by the first few rows of audience members. The subwoofers do not need to be elevated, because deep bass is omnidirectional. In the smallest coffeehouses and bars, the audio mixer may be onstage so that the performers can mix their own sound levels. In larger bars, the audio mixer may be located in or behind the audience seating area, so that an audio engineer can listen to the mix and adjust the sound levels. The adjustments to the monitor speaker mix may be made by a single audio engineer using the main mixing board, or they may be made by a second audio engineer who uses a separate mixing board. The "main" system (also known as Front of House, commonly abbreviated FOH), which provides the amplified sound for the audience, typically uses a number of powerful amplifiers that drive a range of large, heavy-duty loudspeakers—including low-frequency speaker cabinets called subwoofers, full-range speaker cabinets, and high-range horns. A large club may use amplifiers to provide 3000 to 5000 watts of power to the "main" speakers. An outdoor concert may use 10,000 or more watts. The monitor system reproduces the sounds of the performance and directs them towards the onstage performers (typically using wedge-shaped monitor speaker cabinets), to help them to hear the instruments and vocals. In British English, the monitor system is referred to as the "foldback". The monitor system in a large club may provide 500 to 1000 watts of power to several foldback speakers; at an outdoor concert, there may be several thousand watts of power going to the monitor system. At a concert using live sound reproduction, sound engineers and technicians control the mixing boards for the "main" and "monitor" systems, adjusting tone, levels, and overall volume. Touring productions travel with relocatable large line-array PA systems, sometimes rented from an audio equipment hire company. The sound equipment moves from venue to venue along with various other equipment such as lighting and projection. All PA systems have the potential for audio feedback, which occurs when a microphone picks up sound from the speakers, which is re-amplified and sent through the speakers again. It often sounds like a loud high-pitched squeal or screech, and can occur when the volume of the system is turned up too high. Feedback only occurs when the loop gain of the feedback loop is greater than one, so it can always be stopped by reducing the volume sufficiently. Sound engineers take several steps to maximize gain before feedback, including keeping microphones at a distance from speakers, ensuring that directional microphones are not pointed towards speakers, keeping the onstage volume levels down, and lowering gain levels at frequencies where the feedback is occurring, using a graphic equalizer, a parametric equalizer, or a notch filter. Some 2010s-era mixing consoles and effects units have automatic feedback preventing circuits. Feedback prevention devices detect the start of unwanted feedback and use a precise notch filter to lower the gain of the frequencies that are feeding back. Some automated feedback detectors require the user to “set” the feedback-prone frequencies by purposely increasing gain (during a sound check) until some feedback starts to occur. The device then retains these frequencies in its memory and it stands by ready to cut them. Some automated feedback prevention devices can detect and reduce new frequencies other than those found in the sound check. ^ a b Bruce Borgerson (November 1, 2003). "Is it P.A. or SR?". Sound & Video Contractor. Prism Business Media. Archived from the original on May 20, 2015. Retrieved May 19, 2015. ^ "Replaces Bell Boy", The (Culbertson, Montana) Searchlight, July 22, 1910, page 6. ^ "Hear Sermon, Enjoy Pipe", The (Ottawa Kansas) Evening Herald, June 25, 1910, page 4. ^ a b Robert D. Fisher Manual of Valuable and Worthless Securities: Volume 6 (1938), page 75. ^ "Automatic Telephone and Enunciator Carnival Features", Telephony, August 24, 1912, pages 246-247. ^ "Loud-Speaking Telephone Enunciators in Baseball Grand Stand", Electrical World, August 2, 1913, page 251. ^ "Increasing the Revenue Producing Efficiency of a Plant" by Stanley R. Edwards, Telephony, October 11, 1913, pages 21-23. ^ a b Shepherd, Gerald A (1986). "When the President Spoke at Balboa Stadium". The Journal of San Diego History. Retrieved 25 November 2011. ^ a b Crow, Michael M (1998). Limited by design: R&D laboratories in the U.S. national innovation system. New York City, NY: Columbia University Press. p. 145. ISBN 0231109822. ^ Hogan, Michael (2006). Woodrow Wilson's Western Tour: Rhetoric, Public Opinion, And the League of Nations. Texas A&M University Press. p. 10. ISBN 9781585445332. Retrieved 16 November 2015. ^ a b Schoenherr, Steven (2001). "Woodrow Wilson in San Diego 1919". Recording Technology History Notes. Archived from the original on 13 January 2012. Retrieved 25 November 2011. ^ Nigel, Williams. "100 volt line". www.audeval.co.uk. Retrieved 20 November 2015. ^ "UNDERSTANDING BASS MANAGEMENT IN PA SYSTEMS: A Guide for Performers" (PDF). www.cerwinvega.com. Cerwin Vega. Retrieved 8 January 2017. ^ Bob Mesnik. "How Network Attached Amplifiers and IP Intercoms Work". Kintronics.com. Retrieved 2017-01-25. ^ "User Manual for an IP based Long Line PA System" (PDF). Asl-control.co.uk. Archived from the original (PDF) on 2013-06-03. Retrieved 2017-01-25. ^ "Bands Who Do Their Own Sound. Audio Engineering Music Column". Cleverjoe.com. Retrieved 2017-01-25. This page was last edited on 18 March 2019, at 21:12 (UTC).